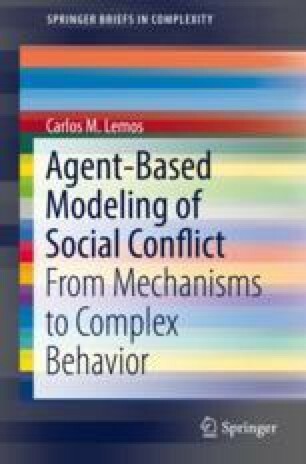 This chapter contains a description of a set of simulation experiments for exploration of the agent-based model proposed in the present work, devised to illustrate the model’s generative capacity and highlight the influence of the newly introduced mechanisms on the complexity of the solutions. The first experiment shows the influence of the critical “cop”-to-“active” ratio ρ c in the risk perception model on the size, duration, and recurrence of rebellion peaks. The relationship between ρ c , the occurrence of cascades and the maximum possible peak size was demonstrated analytically and then studied via computer simulations. It was shown that the value of ρ c has a strong impact on the stability of the system and has associated tipping points. The second experiment illustrates the influence of the maximum jail term on the interval between successive events of social unrest. The third experiment was devised to study the effect of value-sensitive deprivation in a scenario of low legitimacy and high level of repression. It was shown that the model can produce solutions with three different regimes (calm, punctuated equilibrium, and permanent turmoil) for low values of legitimacy. It was also found that the solutions’ behavior is strongly dependent on the parameter γ that controls sensitivity to deprivation, which has an associated tipping point for the setup conditions considered in the experiment. The fourth and fifth experiments illustrate the effect of combining RD-dependent grievance with legitimacy feedback in the same scenario of low legitimacy and high level of repression considered before, and how legitimacy feedback leads to solutions with intermittent regime in an otherwise stable scenario with high legitimacy and low level of repression. The final experiment shows how network influence effects lead to instability for the two types of networks implemented in the model (“group” and “influentials”), and that the degree of connectivity has a larger impact than the influence weight on the magnitude of the simulated events.